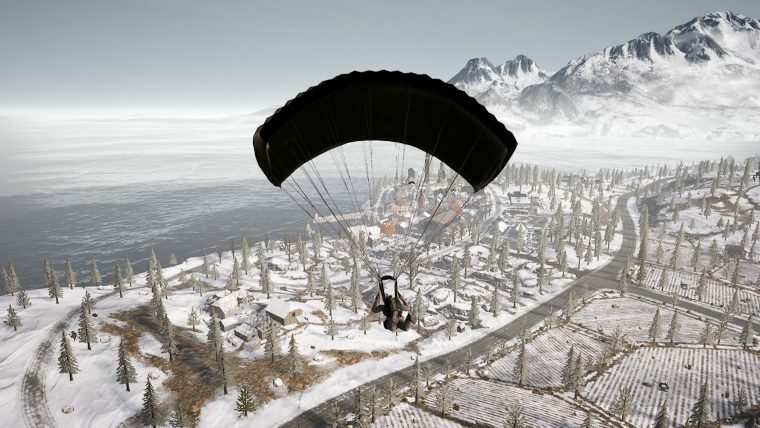 We’ve been to the forest, the desert, and a tropical island in Playerunknown’s Battlegrounds, but Vikendi, the newest map in PUBG, takes us to a hilly frozen tundra, located on an island somewhere between the size of Erangel and Sanhok. 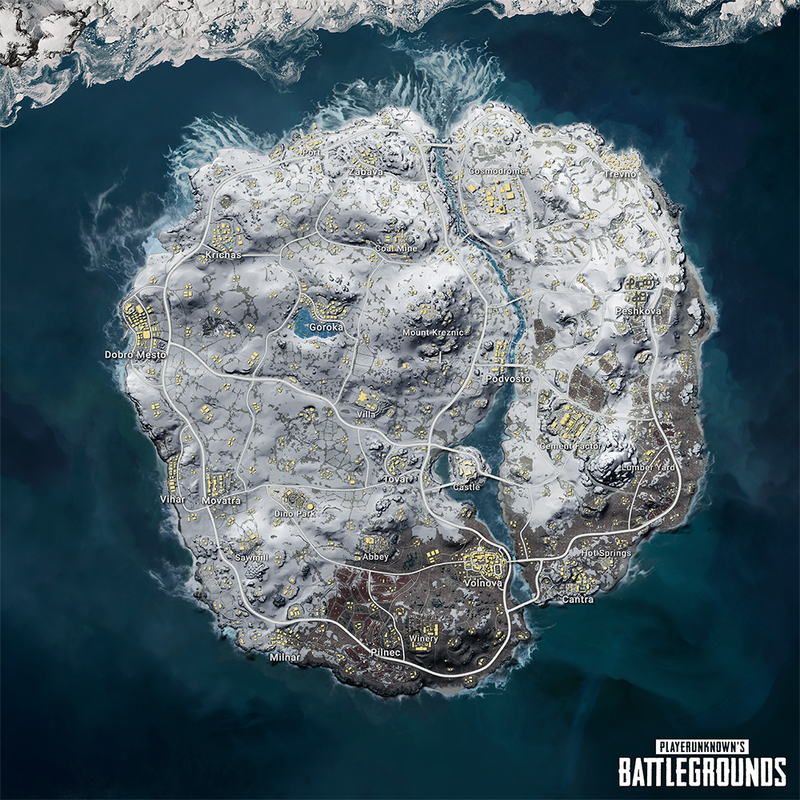 The map release also comes with a host of exclusive features and game adjustments, so we’ve put together this Vikendi map guide, where you’ll find everything you need to know to get started with playing the new map, such as the deadliest areas to drop into, best loot locations, Vikendi-exclusive weapons and vehicles, and some tips for getting that warm chicken dinner to feed you through the winter. 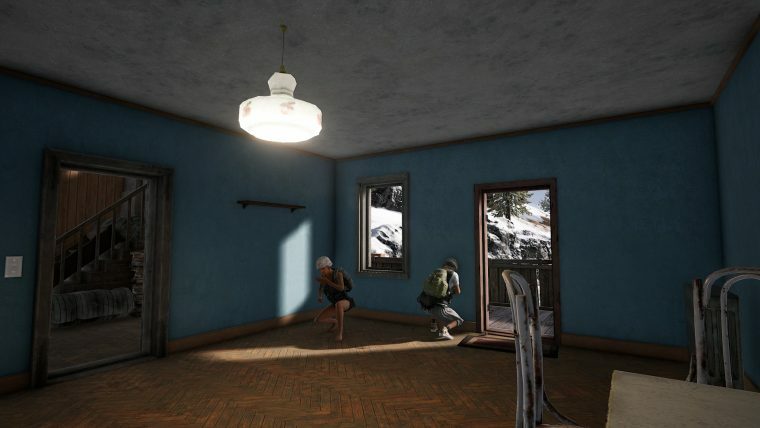 Vikendi marks new territory for PUBG players in more ways than one. 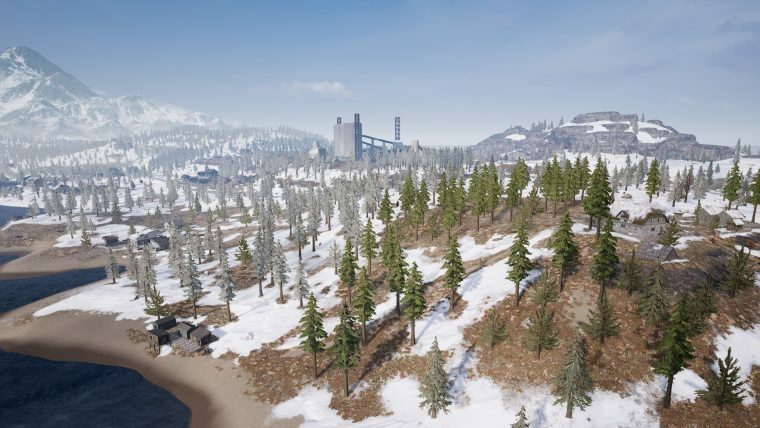 Aside from the stark change in scenery from the other maps with Vikendi’s snow-capped terrain and abundant winter flora, the map features some adjusted loot drop rates, a new assault rifle to get to grips with, and a smattering of other mechanic updates and new features. The 6x6km map offers players an experience and game pace that the developers hope will lay in the Goldilocks zone between the tiny Sanhok and the larger maps, Erangel and Miramar. For more about how to get into PUBG generally, as well as some details on the other maps, head to our Playerunknown’s Battlegrounds guide hub. 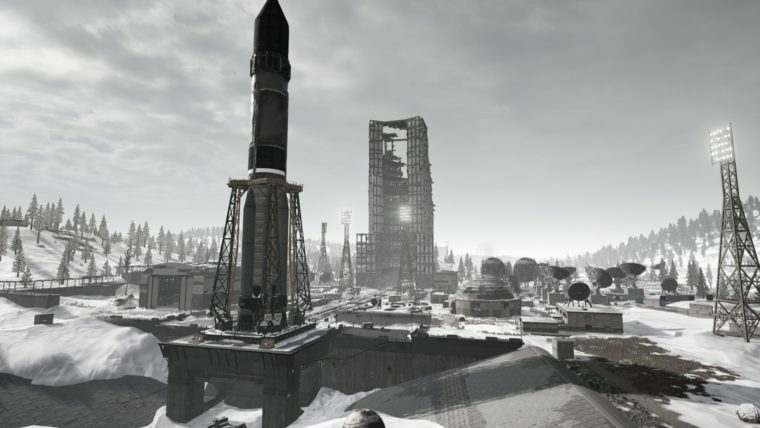 Vikendi is comprised of 27 named locations, each with varying quantities of loot. The map has been data-mined for details on the best spawn locations, so check out this map for more specific details on vehicle spawns, as well as the different evaluations on how loot-rich a specific spot is. It is almost universally agreed upon that Vikendi loot heavily favours SMGs, particularly the Micro-Uzi. Also markedly more common than in other maps are smoke grenades, scope attachments, Level 3 military vests, and Level 3 helmets – the latter of which now spawns in the world normally rather than only being attainable through air crate drops. However, you’ll find comparatively few opportunities to walk around with a Kar98k, a Mini 14, or an SKS, as the spawn rates of sniper rifles and DMRs appear to have taken a hit. This leaning towards close-ranged weapons, coupled with the copious amount of cover provided by buildings and trees alike, makes for an experience where you’re much more likely to kill or be killed from a dozen metres away than from a couple hundred. 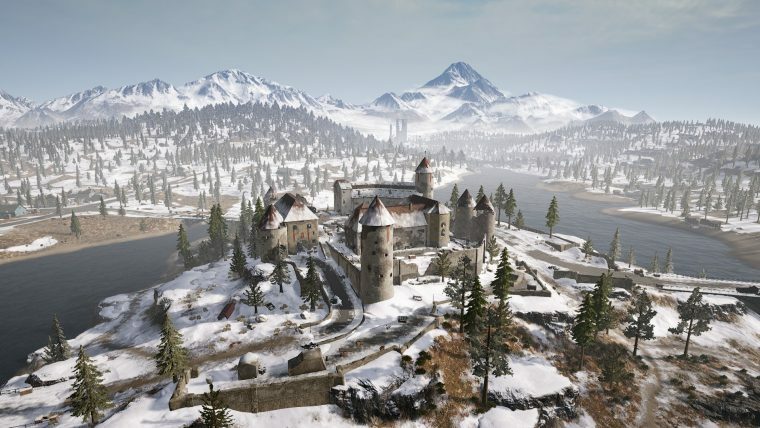 Castle is by far the most popular destination in Vikendi thus far, set to become to Vikendi what Hacienda is to Miramar (which you can find out more about in our PUBG Miramar guide). It is a fairly central and defensible location, surrounded by water on all sides. The walkway near the main tower is a great sniping spot, allowing for teams to gain some free intelligence, though the interior is also relatively open. Crouching between the walkways provides you with a lot of cover from other players, potentially giving you the advantage. There’s also a ton of good loot to be found here, so if you can manage to survive the masses also dropping here then you should be able to get equipped with some very decent gear. Goroka is the other big party location where everyone wants to fire their guns around. This rather tightly laid out town is built upon a small mound, meaning that there’s a fair bit of verticality to consider. Goroka is large enough that you won’t need to explore it all to find decent weapons and gear, as well as a tonne of vantage points for coverage down towards the lake. The large hill nearby is also an excellent sniping spot for those lucky enough to get their hands on a sniper rifle and scope. There are also some other not-so-popular positions that have some decent loot, such as Dobro Mesto and Volnova. They tend to get quite hot when the flight path runs over the top of their position and so you should proceed with caution in these areas, particularly if there are still lots of players in the plane before getting to those locations. Finally, here are some locations slightly off the beaten track that can prove have everything one would need if playing Solo. Despite the fact the main part of Dobro Mesto has some very good loot, there’s also a lot of other players that could be running around. For those who don’t wish to engage immediately but still want half-decent loot, the shacks that you can see in the bottom left part of the image above, up the hill slightly, have some very good weapons and in our experience a full set of level 3 armour. Of course this won’t spawn every time, but the potential is there. It’s also not very far away from some farms across the fields to the east that also have plenty of good weapons, throwables, and armour. Cosmodrone is a massive complex that has a decent amount of loot, but it’s all very spread out. 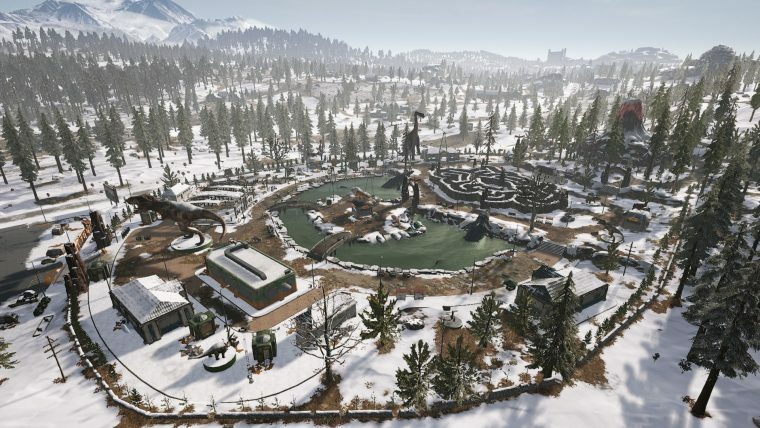 What makes this area a lot more interesting is the fact it has underground parts, safe from the threat of sniper rifles and other players driving around in vehicles. One particular part is on a cliff face, with a gantry leading up to it. It can provide some excellent cover, as well as the opportunity to escape if you are discovered. Look particularly in the dilapidated building to the south and the western structure for the highest concentration of stuff. Provided you are on your own, this last one may be worth considering. Since there’s a higher chance of scopes and higher-tiered armour/guns lying all around the place, even smaller locations can give you exactly what you need to have the edge on your opponents. This location is also relatively close to a couple of vehicle spawn locations, as well as some docks just down the hill. Since this is one route into the castle area, you can try to attack anyone emerging from that area to seek items in the Cement Factory, or those trying to storm the Castle. The docks can provide a nearly completely safe hide for you to shoot from a distance. The Hot Springs just outside Cantra at the bottom of the map are a favourite place of mine for solo play (duos and squads, however, might find somewhat less loot here than they’d like). 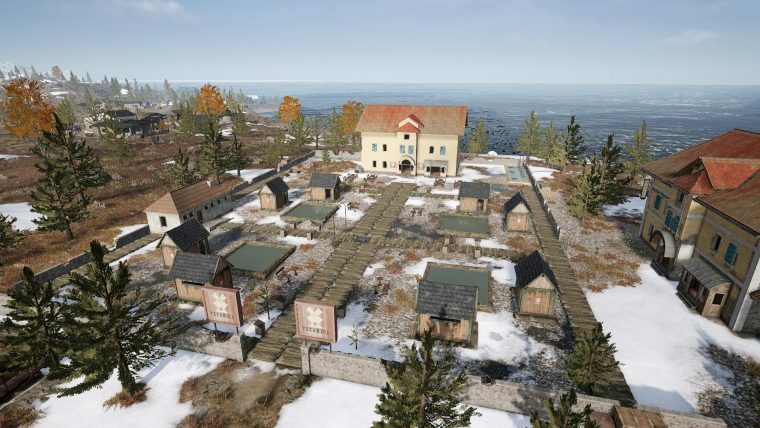 While far from a central location, the Hot Springs’ two major houses overlooking a square of minor sheds and loot points have reliably provided me with enough good loot to start rotating West to Cantra or North to the Cement Factory or the Castle in order to get a few kills and a whole lot more gear leading into the mid-game. This isn’t a particularly good location for loot, but it’s popular for one very important reason: it is full of dinosaurs. Therefore it is infinitely awesome and you should at least check it out once to see the T-Rex and other dinosaurs in their full ferocious splendour. 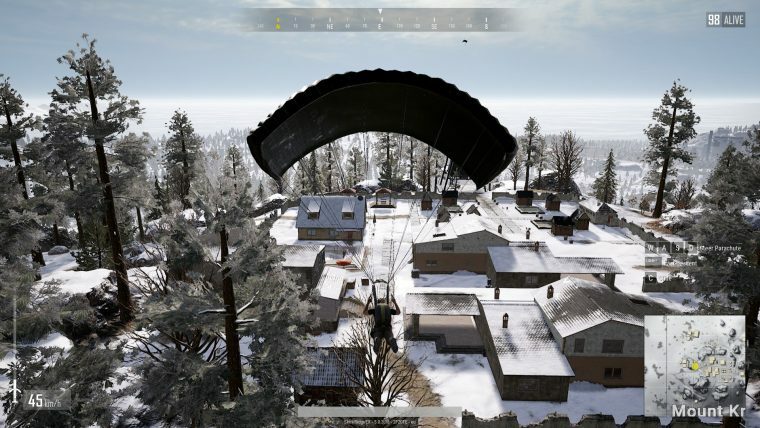 Plunkbat’s release of the new Vikendi map coincides with a complete overhaul of the game’s venerable parachute system. Now, players can enjoy a much greater responsiveness during their downward trajectory, particularly while turning in the air, which always used to be a rather painful affair that involved the game taking half a second to catch up with your every input. Even more importantly, a brand new free-falling action, bound to your sprint key (Shift by default), puts you into a full nosedive, allowing you to max out your descent speed at the push of a button rather than having to manually orient yourself to achieve the same effect. This is also true after you have deployed your chute, where you can either hold sprint to head straight down, or hold C to glide straight. Drop from the plane around 600m away from your destination. Immediately accelerate to 200 km/h or more by holding sprint as you leave the plane, then level out once you hit 200. Fly fairly straight at 205-210 km/h towards your destination, until you are around 100-120m away from the drop point. Hold sprint again to nose-dive at the 100-120m mark. The aim is to deploy at 231 km/h or more, so that your momentum brings you down faster than those around you who do not employ this tactic. When you are close to the ground, you’ll see a prompt to cut the parachute cord, which can make you drop that last few feet much faster than leaving it attached, though you may take damage if you’re too high up. Fans of PUBG’s SCAR-L will be disappointed to hear that the popular assault rifle does not spawn at all on Vikendi. 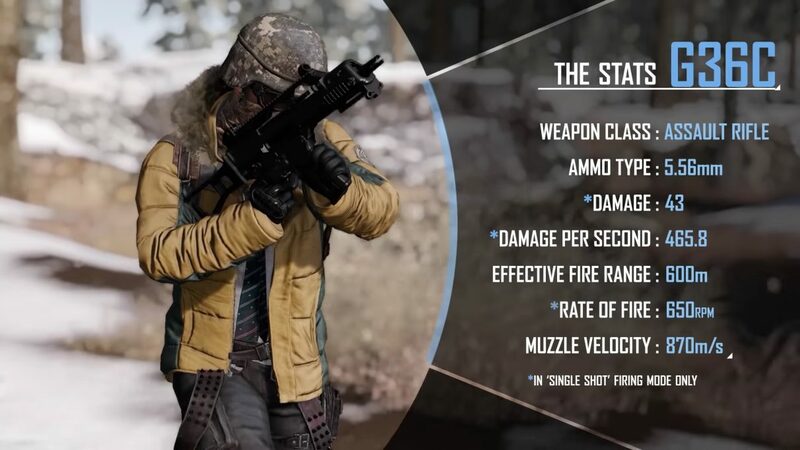 Taking its place is the G36C, an assault rifle/carbine hybrid weapon exclusive to Vikendi. This newcomer takes 5.56mm ammo and houses a magazine of 30 bullets, which can be bumped up to 40 with an extended mag attachment. As with many other weapons, the gun can be toggled between single shot and full-auto. The G36C is described as having similar stats to the SCAR-L but a slightly faster rate of fire. It takes all the attachments a SCAR-L can take, minus the half grip and the thumb grip, both of which have been removed from Vikendi. However, the gun’s large recoil offsets its slightly higher damage per second, with many players commenting that the G36C is difficult to control in full-auto mode. You’ll want to use the weapon like an SMG, taking advantage of its close-range DPS prowess but choosing other weapons to pick off players at a distance, because the G36C may disappoint you in this regard. 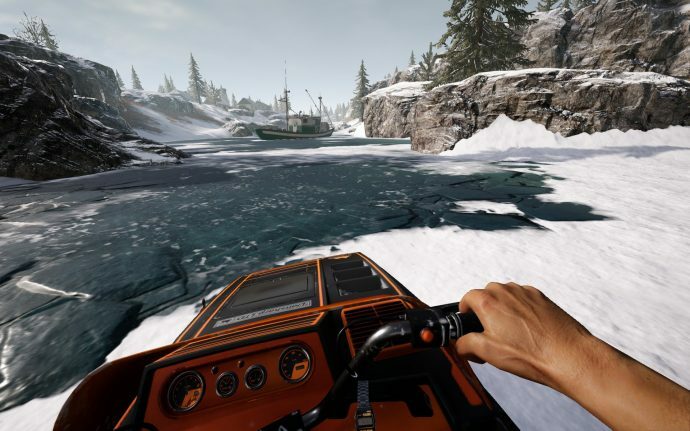 Snowmobiles have entered the fray in Vikendi, with these nippy two-seater vehicles scattered across the map in various named and unnamed locations. The handling and drifting capabilities take some getting used to, but they provide a better method of travel than any other vehicle on Vikendi. As you might imagine, snowmobiles are excellent on snow and particularly ice, reaching top speeds of up to 100km/h along clear stretches of their favoured terrain. Less appealing, however, is the vehicle’s predilection for skidding out of control or crunching to a halt along grassy areas, so mind your travel path whenever you hop into a snowmobile. They also easily explode under moderate fire, so you’d better make sure you keep moving if someone starts spraying shots at you, because the snowmobile’s speed is the only thing that will save you in those situations. It’s also worth noting that, as previously indicated, snowmobiles leave very distinct tracks in the snow, so other players don’t exactly need a degree in tracking to hunt you down. But it’s often a price worth paying. Snowmobiles are a quick and reliable form of transportation across the map, and a lifesaver when it comes to escaping the blue or red zones. For now, the best thing to do is to spend time dropping in all the different locations. The more central towns will be hottest, as well as the coastal areas first hit by the flight path. 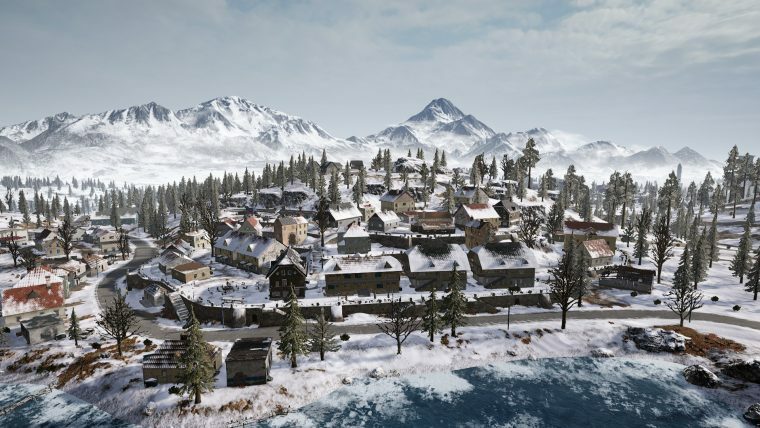 Learn Vikendi’s early game, learn the rotations, and expect things to change – particularly in terms of loot spawn rates – once the map goes live in the main game. The first safe area outside of the blue zone is smaller than in other maps, forcing players to finish looting and start moving sooner. However, there’s no difference in how much damage the blue deals if you’re outside of it, or any of the subsequent safe area circles. Don’t worry about breaking the ice in this map, as it doesn’t break at all, even under fire or when driving heavy vehicles over it. Use the terrain wisely to avoid sniper fire, but be wary of enemies that decide to rush you instead, forcing close-range encounters that could take you by surprise. Try to stay off the snow as much as possible as it leaves tracks (even if you are prone) and makes you more visible to your enemies. A white ghillie suit helps mask your presence in the snow, but still won’t prevent you from leaving tracks. When facing the sun it can create a bright white haze, which makes it difficult to see and spot people in that direction. Move yourself to somewhere where the sun isn’t blinding you, if you can. With the new map comes an M16A4 nerf to the gun’s rate of fire. Given that the M16A4 has already seen a big nerf recently, this makes it all the less attractive compared to other Assault Rifles. Other than the tips mentioned in this guide, there’s a lot of transferable skills that you may have picked up when fighting in Erangel. We’ve also got plenty more tips for you over on our PUBG Erangel map guide, so be sure to have a gander at that guide should you need a few more tricks in your arsenal. Then there’s our PUBG Sanhok map guide for those looking for tips on that pacific island-inspired map. If you have any tips on the new map, do be sure to share them with us so that we can update this guide with further details as they become known.